It is long overdue for Robert Mugabe and his gang of thieves and crooks. He must go. They have wrecked what was once called “a jewel in Africa” (Julius Nyerere). Zimbabwe used to be a shining example of progress. It has become a cesspool of lawlessness, violence, hate and indiscriminate abuse of power. Many people have advocated that Mugabe and his fellows should go. Just look at all the people that fled the country, or at the protests facing Zimbabwe’s embassies around the globe. Their cause is sympathetic but hopeless. Mugabe has no shame and will resort to any measure to keep himself in place. 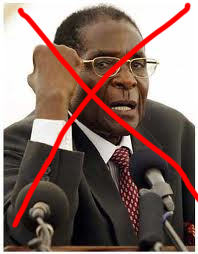 Nothing will change, because Mugabe knows that as long as he controls the means to violence, he will get what he want. In the 1970s, the only way Mugabe and ZANU-PF were able to penetrate into Rhodesia was by forcefully bullying the peasant population into submission. Anyone who didn’t cooperate was tortured or killed in front of others. People were stuck between a rock and a hard place – the Rhodesian security forces and Mugabe’s ‘liberation’ fighters. Only, the hard place was harder than the rock – Mugabe was much more brutal than the security forces. Even during the 1980 elections, he could never have won without massive intimidation of the voters, especially in the Shona areas. He found out for himself, that as long as he was more brutal than the others, then he would win. He did the same thing in the 1980s, when his Matabele comrades in arms found out what he really was – a lowly jackal and a turncoat. He murdered many thousands of Matabeles to secure his position. The only thing he really respected, because they stood in his path to tyranny and dictatorship, were the Rhodesian security forces. They nearly killed him. He hated them and he hated Ian Smith, but he also respected them because they answered his language of force with counter force. Smith’s presence in politics in the early 1980s probably kept him from going all-out like he did in the 1990s and 2000s. He is hated by his people. Ian Smith said, in 2003, that if he and Mugabe were to walk into a black Harare township together, only one would come out alive. Smith was confident enough to do it. Mugabe isn’t. He hurries along in his huge motorcade. So, there you have a dictator who is afraid, who is reviled by his people and everybody is desperate for a change. What can be done about it. A protest? Nothing will change. More drastic measures must be taken. I say, let’s get rid of him and his thieves. I say, let us complete their task and stand up against Mugabe. Let him feel the power of the gun. Let him run into the bush with armed units after him. Rise and dismiss the dictator. Kill him and all his cronies in the most ferocious way possible. Zimbabwe needs new men of steel, like Ian Smith or Ron Reid Daly, who are willing to take up arms against Mugabe. A new Chimurenga must take place, but this time, to restore the values that were buried when Rhodesia disappeared.